Game Courts may be affected by dirt or mud, debris falling from nearby trees, overspray from sprinkling systems, or even chemicals and other materials. Although there are very few chemicals that will damage the tiles, there are a few basic rules to keep in mind. Don't use hydrocarbon-based cleaners or products (such as mineral spirits, Stoddard solvent, naphtha, kerosene, diesel fuel, and gasoline). The cleaners themselves shouldn’t damage the tiles, but they will often leave a film or residue that is difficult to remove and may impair the slip-resistant properties of the surface. Don'tallow petroleum distillates (paint thinner, gasoline, oil, etc.) to remain in contact with the tiles. Wipe up or wash off spills as soon as possible. Don't use bleach or other chlorine-based cleaners, as they attack the structural integrity and colorants within the tiles. The key ingredient to avoid is sodium hypochlorite (in bleach). A blower may also be used to clean the court surface of light debris and leaves. Use a heavy degreaser for oil, grease or tar removal. These cleaners typically have emulsifying agents that help pick up the stain and hold it in suspension so it can be washed away. If degreaser doesn’t work, you may use a solvent, if you employ some simple precautions. In a small area, use a cloth with a small amount of a solvent such as acetone to remove the stain, and then re-clean the area with a detergent to ensure that no chemical residue is left behind. Chewing gum is difficult to remove while warm, so use a freeze spray product to make the gum brittle, and then pry it off with a chisel or flat-headed screwdriver. You may need a small amount of solvent to completely remove the gum. In areas with high mineral content in the water, sprinkling systems can sometimes leave a white or light-colored deposit on the tile surface. While this won’t adversely affect playability, it can detract from the aesthetic appeal of the Game Court. If at all possible, try to route or redirect sprinkler spray away from the court surface. To remove hard-water deposits, use a mixture of water and “basin, tub, and tile cleaner” (products like CLR®). These products contain acids that will break down mineral deposits. A stiff-bristle brush or broom can be dipped into the solution, and then rubbed vigorously over the affected areas. and then thoroughly rinse the area. Your Sport Court Dealer can provide an annual or periodic “deep clean” to your tile surface, typically by using a pressure washer and/or lifting segments of the surface to clean beneath. Depending on location, a fair amount of debris can accumulate in the open grid of the tiles over time, so it’s a good idea to occasionally clean the concrete subsurface more thoroughly. As a polypropylene product, Sport Court’s performance surface is subject to some expansion and contraction as temperatures fluctuate on your Game Court. Your Sport Court factory-trained installer will trim some of the tile around poles, walls, or other obstructions, to allow for some movement as the tiles expand and contract. One of the safety features engineered into your Sport Court performance surface tiles is our patented “lateral forgiveness,” which provides for side-to-side shock absorption, to reduce wear and tear on ankles, knees, and limbs. 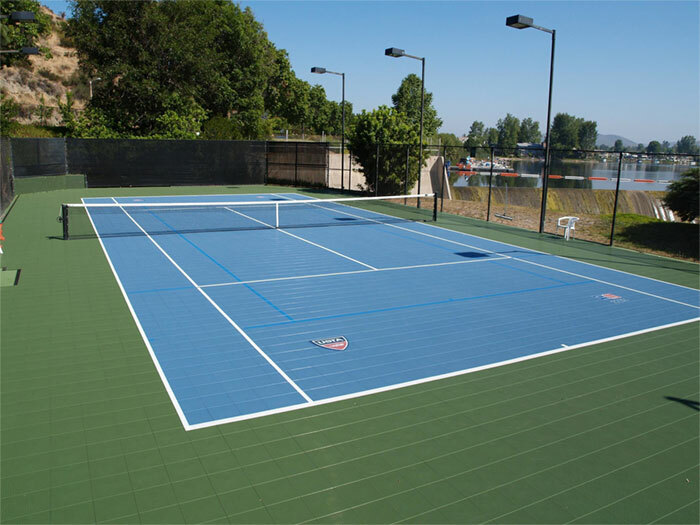 In order to maintain this benefit, the Sport Court performance surface is not generally anchored to the concrete subsurface, and may occasionally need to be slightly repositioned on the slab. Your Sport Court installer can show you how to make minor adjustments in the placement of the tile. Ready to Design your Sport Court? Already a Sport Court Owner? Fill out a survey and let us know what you think. Address: 5445 W Harold Gatty Dr.
© Sport Court. All Rights Reserved.